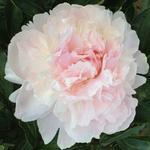 Peonies have been successfully taken up and replanted at any season of the year. The best time is in late summer and autumn. At that time they are dormant or going into dormancy, enabling you to have easily cared for replant material freshly fortified with stored food. Late summer or autumn dug and replanted into moist soil your peony will get off to a normal growth cycle, quickly starting new root growth upon declining soil temperatures. The plants will be going dormant when the foliage is rapidly losing the green color of its leaves, with healthy plants in colder climates this is typically seen during September. Matured peonies will have an extensive system of thick storage roots; so large it is not practical to obtain the whole root system after two or three seasons of vigorous growth. Do dig so as to keep a 6-10 inch length of the big storage roots for the replant pieces. 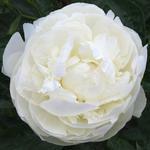 You can either take a "pie slice" out of an established peony or dig the whole plant. Either way an elongate spade is a big help. To lift the whole plant, start by digging about 8-10 inches out from the stems and circle the plant. Cut straight down the first time around to make a 3-4 inches trench. On the second time around angle the spade inward. The idea is to undercut all roots at 6 inches or more length. Try to avoid prying with the spade - good roots will be lost from breaking away at their tops. Instead, go around again and again until the root ball is cut loose and can be rolled out of the hole. From this point on you are concerned with how you will divide the plant, treated below. 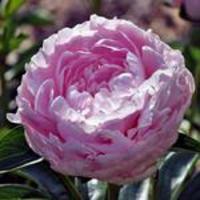 For a single piece from a large peony plant, take a wedge of the crown and an associated length of storage roots as above. A wedge 6-8 inches wide where the outer stems emerge from the soil is a good size. Cut straight down to release the sides of the wedge. Some plant material will be wasted because you are digging blind. However, so long as you get a minimum of 1-3 large buds that are well supported with stored food you will have a satisfactory planter piece. Smaller pieces will require more careful attention to get them through the first year. Back fill with fertile soil where you took the piece. The source plant will close the gap with its growth. When taking up a whole plant, division is a must. Expect disappointing results if you reset a whole peony after having shortened the storage roots. It will take the plant years to restore the root-to-top balance sufficiently for normal flowering, if ever. The divisions will act as starter pieces from which a new plant will grow. If you have to take up a plant early in the growing season it is OK to replant temporarily and lift again in late summer to make the divisions and get them replanted under autumn conditions. For quality divisions, remove all soil so you can see where to make separations. Work out excess soil at the dig site and inspect the roots for freedom from rot or parasites. Wash well to finish the cleaning, both for good visibility and for your safety while cutting - you do not want to be forcing a cut while grasping a crown slick with mud. Where to cut? Think of the current year shoot as having direct vascular connections to one or more roots. You want to retain these vascular connections in your divisions. 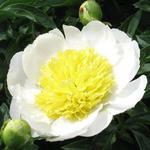 In summary, the living perennial organs of your peony are two. One is made up of the crown, it being the perennial, underground stem portion, normally also plump with stored food. More importantly the crown bears the large buds that will make leafy shoots next spring. The second organ is made up of the large food storage roots. After the original plant is out of the ground, reduce it to divisions that will serve as the starter pieces from which your new plants will grow.